In 2011, the winning bidder for another copy shelled out $2,161,000. I'm more than a little curious about the shipping options being offered. Armored car? Blackwater Security? The Winter Soldier? The seller, collectibles dealer Darren Adams, will be donating part of the proceeds to the Christopher & Dana Reeve Foundation. When we last left Glenn Talbot, he'd settled into his new position as Security Chief under General "Thunderbolt" Ross's command. 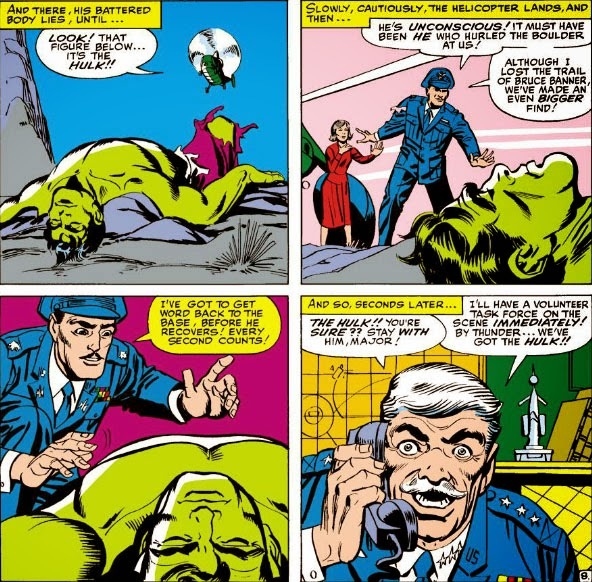 Major Talbot definitely hit the ground running, first by beginning an investigation into Bruce Banner's connection to the Hulk and, later, managing to be on the scene to capture the Hulk after he'd collapsed following a battle. Talbot seems to be a rising star, alright--not only impressing his commanding officer, but also making inroads with Ross's daughter, Betty. Banner has had a time of it lately--not only believed to be a Communist spy, but also taking a bullet to the head in a recent altercation with armed soldiers and presumed to be dead (though we can peek out that window and realize that he survived, thanks to, of all people, the Leader). And because Banner has been pronounced dead, it becomes harder for Rick Jones to justify keeping Banner's secret of being the Hulk--especially when the truth might help to clear Banner's name. 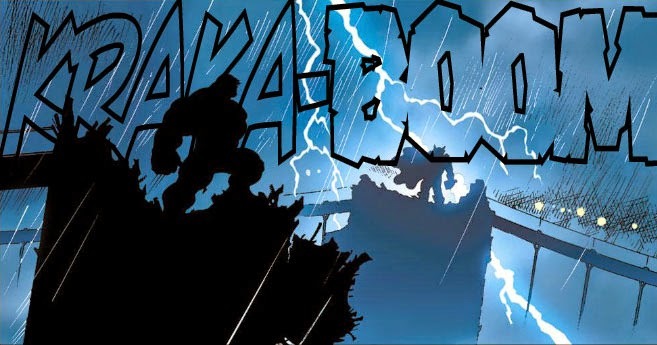 In the meantime, the Hulk, in attempting to save Rick from incarceration, is blasted by a time displacement gun of Banner's invention and sent to the future, there to encounter and battle the Executioner. 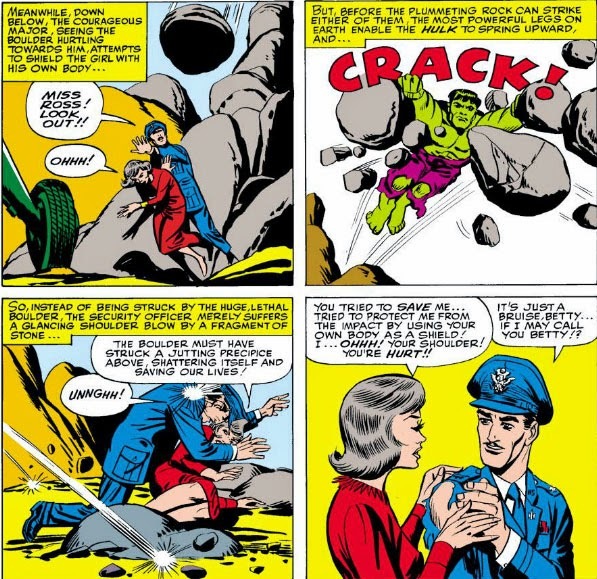 But Ross and Talbot only know the Hulk has disappeared, and are scrambling to locate him--while Betty, clearly still having feelings for Banner, has about had it with all the accusations being leveled against him, and had it as well with Talbot's persistence at trying to move in. And so the moment comes when Rick can bear the burden of secrecy no more. And guess which officer is there to offer his ear to bend? But I think it's safe to say we've reached the bottom of the barrel with this one. "The Invincible Seaweed Man." Try designing the masthead for that title. 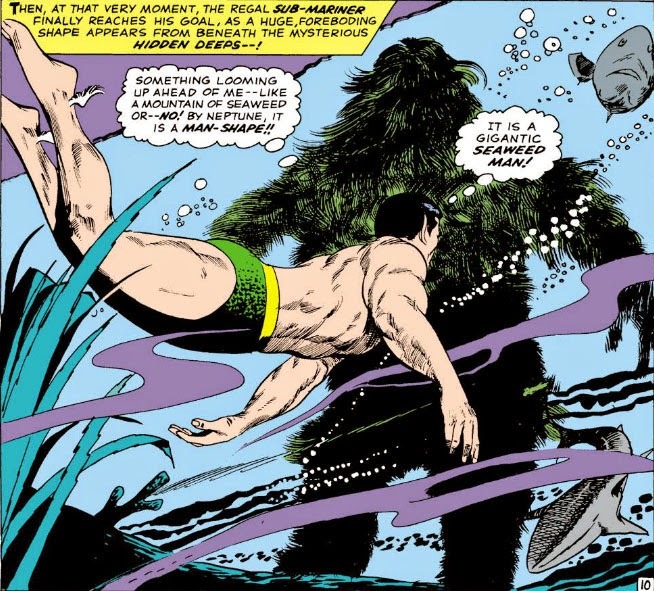 Thankfully, the Seaweed Man (I can't even type that without wincing) never got his own comic, nor did he ever catch on as a villain (though parts of him likely kept catching on pieces of coral and shale down in those depths). 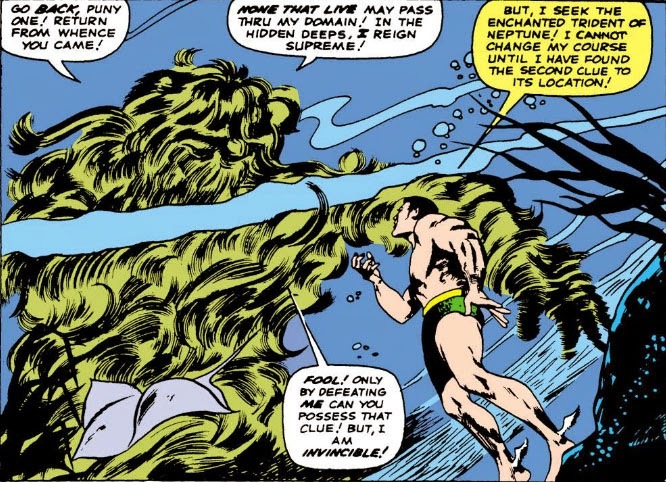 He was simply one of the deadly sentries that Namor had to overcome on his way to obtaining Neptune's enchanted trident. 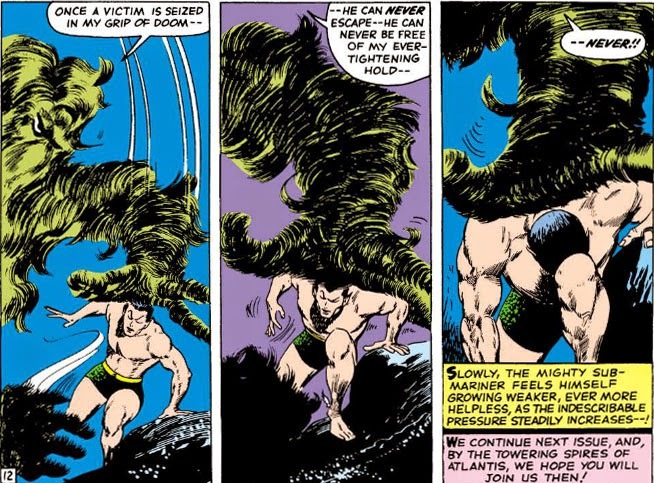 It's too bad Namor didn't have a trident on him here--he could have curled the Seaweed Man in it like spaghetti. 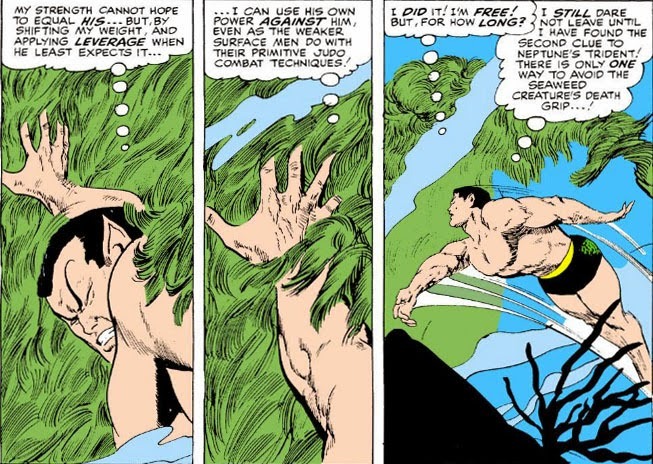 So that was Namor's epic battle with the Seaweed Man--and to hear Namor talk, you'd think he still has nightmares about this creature to this day. Come to think of it, "Stalked By The Seaweed Man!" is a sequel just waiting for a writer to tackle. I hope he's up on his martial arts. The Dazzling Return Of--The Swordsman! 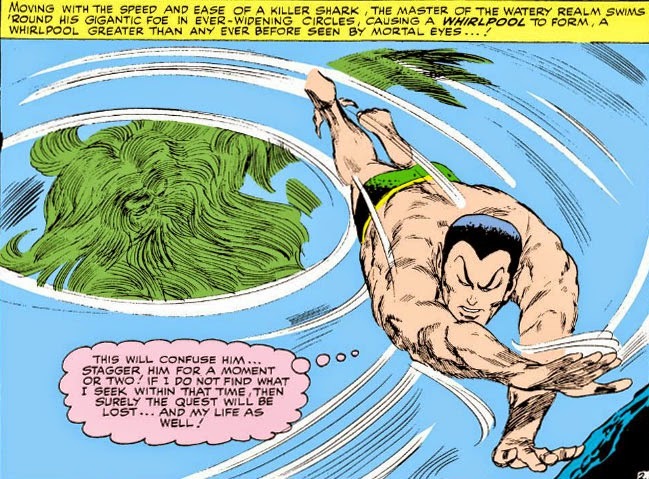 Yes, the Swordsman returns to the Avengers--and with him, the enigmatic Mantis. But will they be friends or foes to the Avengers? It certainly looks like the latter, doesn't it? And when the time comes for this pair to make their intentions known, the Avengers will have cause to think so, too. Back From The Dead--Captain Marvel! 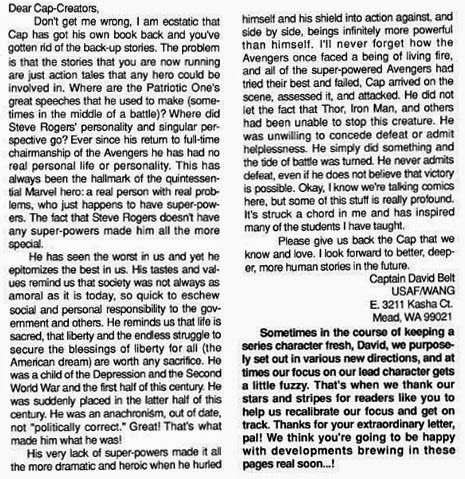 During the Marvel Civil War comics event, I was one of those who picked up a number of the secondary issues associated with it. Links-in-a-chain stories that seemed meant to entice the reader in a sales cycle toward the main series, and, by extension, more of those issues that were scripted separately yet closely tied to it. Those linked stories never really resolved the disagreements or divisions that were ripping through the main title--mostly, they were supplemental reading, and some of them were actually nicely written and fairly satisfying. 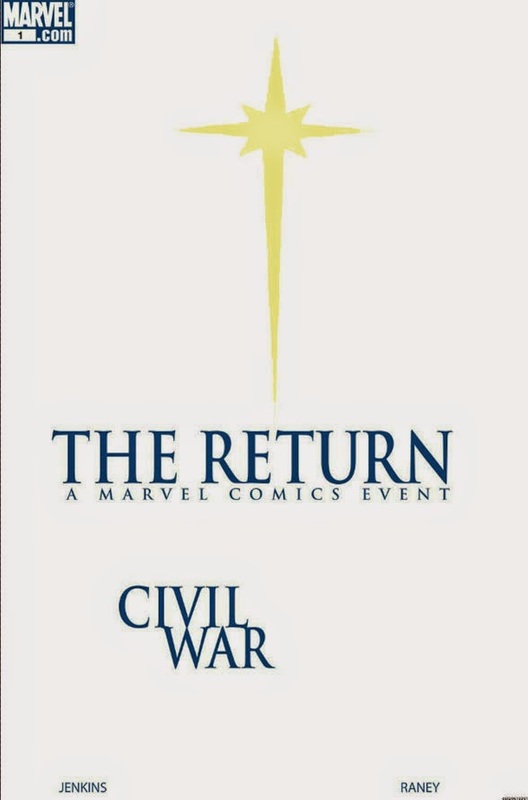 Some, however, like "The Return"--the issue that heralded the original Captain Marvel coming back in his own title--couldn't help but remind you of a carrot on a stick, enticing you with the promise of something good but instead leading you on and leaving you with very little of substance. 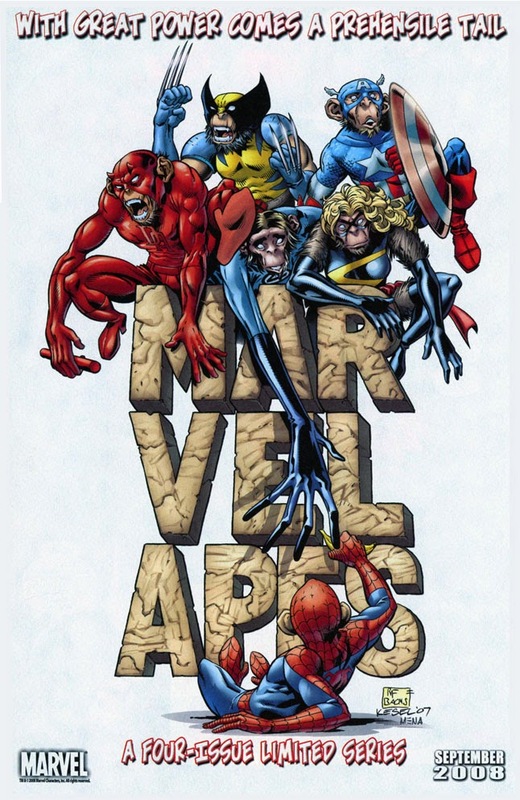 I took this cover at its word: "A Marvel Comics Event," it proclaimed. I guess that depends you how you define the term. Instead of saying, "Wow, what an event! ", you're likely to finish the story saying, instead, "That was an event?" Perhaps the stark white cover should have been a tip-off, with its virtual promise of an extraordinary tale within and which wasn't about to give you even a peek of what the story was about. You'll notice the iconic "star" graphic which of course resembles the one on Mar-vell's uniform--but in the spirit of full disclosure, I've enhanced its outlne and coloring, since on the original cover you can only barely make it out (assuming you squinted, and caught the cover in just the right angle of light). All of that said, the story does its job of opening the door for Mar-vell's return. You could even regard it as Captain Marvel #0, before going on to pick up a copy of his first issue. 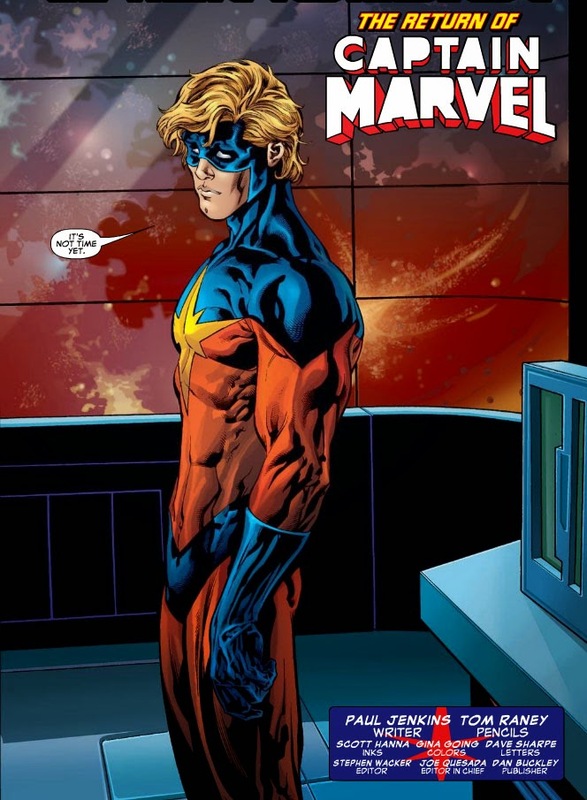 It probably goes without saying that the truth behind his miraculous return from the dead (as well as his identity) would be reserved for the later main title; but in this particular issue, we find Mar-vell going over in his mind the circumstances of his death and rebirth, as well as the complications that would arise as a result. But, boiled down, the story could be summarized by a quote from Jean-Luc Picard: "A lot of questions. Damn few answers." Most intriguing of all, perhaps, is how and where the story begins--in the special incarceration facility in the Negative Zone known as "42," built to detain those super-beings who refused to comply with the Super-Hero Registration Act. And guess who the warden of the prison turns out to be? No. No, I'm sorry, absolutely not. I have to draw the line somewhere. 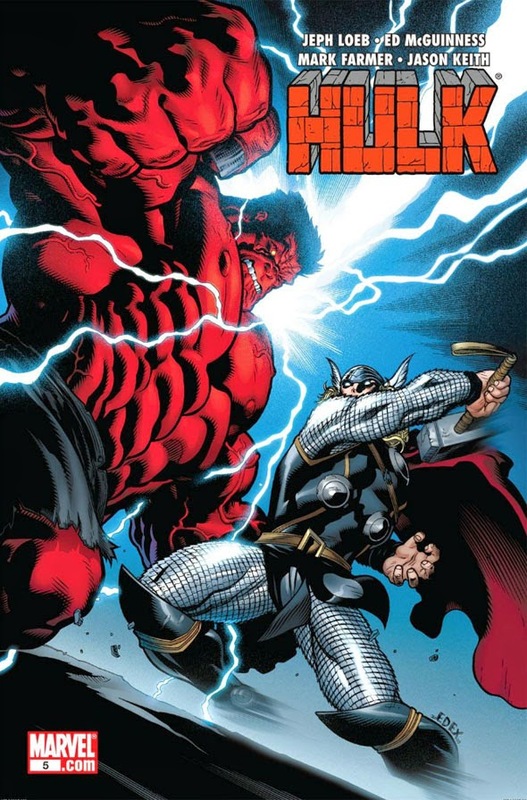 Riding on the coattails of the World War Hulk event was the 2008 series featuring the "Red Hulk"--a savvy, aggressive new manifestation of the Hulk who began a rampage of destruction and attacked and defeated a number of powerful Marvel characters (as well as destroying the SHIELD helicarrier) before finally being brought down. I remember thumbing through the first couple of issues at the store and putting them back on the rack, finding little at first glance to hold my interest. 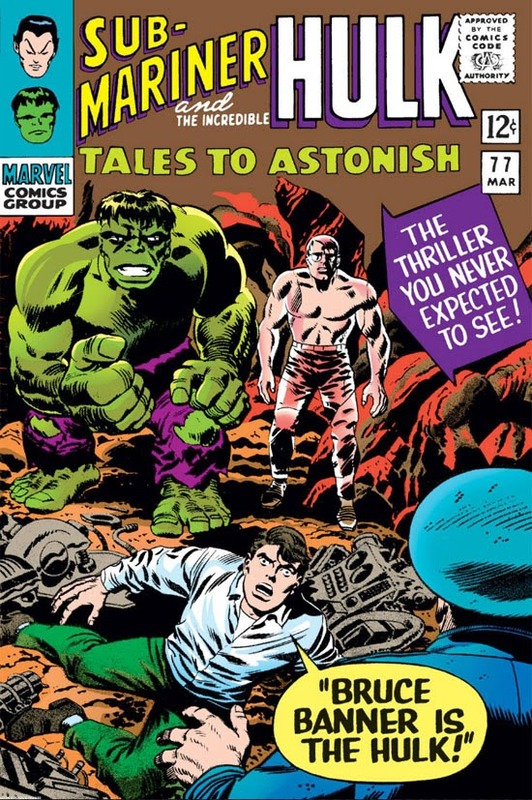 The art placed a great deal of emphasis on the new Hulk's over-proportioned physique (complete with bulging veins), while the stories seemed focused on destruction for the sake of destruction and didn't appear to contain much depth otherwise. 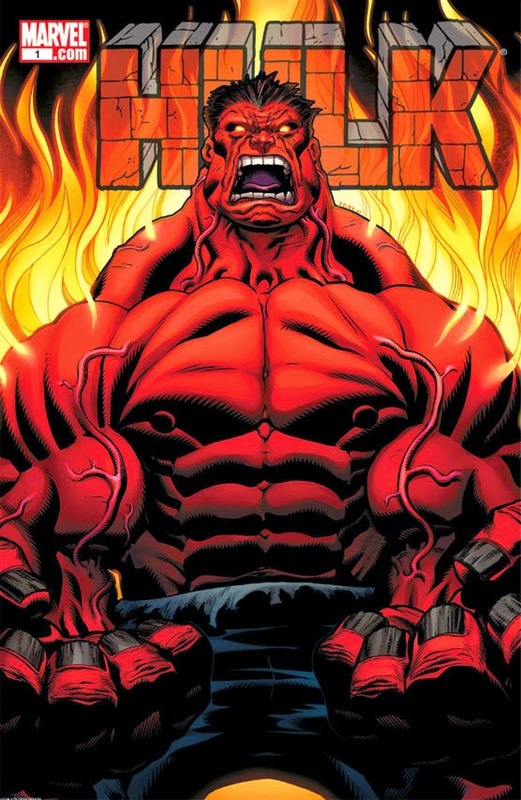 The hook of the series ended up being, "Who IS the Red Hulk?" (or "Rulk," a groan-worthy amalgam of the words that the stories made every attempt to have catch on, but thankfully never really did), a mystery which probably did more to sell the issues than the actual stories. 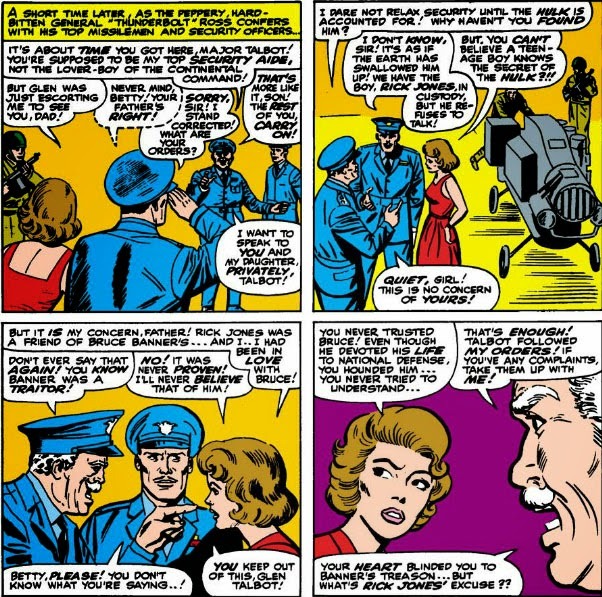 It wasn't until two years later that the Red Hulk's identity was revealed to be "Thunderbolt" Ross; and just to prove how bad bad can get, there was also a "Red She-Hulk" on the scene--none other than the General's daughter, Betty. Eventually, the green Hulk returns, as well. And you thought the heated arguments at your Thanksgiving table were off the scale--I imagine the Banner/Ross sit-down must be close to nuclear. 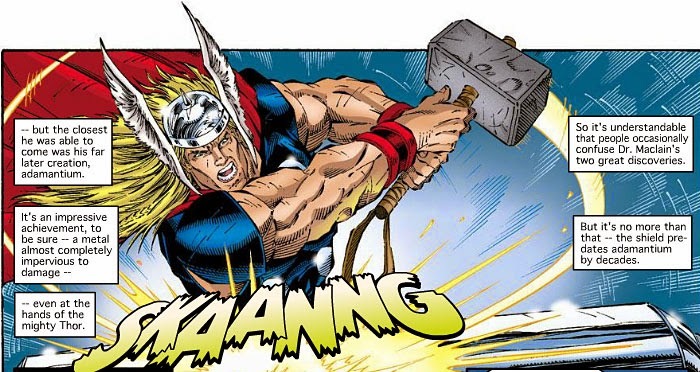 Thor had also returned with new stories, his well-written issues a stark contrast to the Red Hulk books--and I had to admit to being curious about another Hulk/Thor match-up, particularly with a reputedly more powerful version of the Hulk on the scene and a new no-nonsense Thor ready to cut loose. So against all better judgment, I decided to bite the bullet and pick up this battle issue. I should caution you beforehand by reminding you that this is 2008, where issues with prolonged battles generally have their artwork carry the day and only bring in dialog on an as-needed basis--so the battle isn't going to be enhanced to any degree by the insertion of characterization along with the swinging arms and the bold you-will-fall! declarations. That's not to say you won't find the fight entertaining--but you may reach the end of it wishing that writer Jeph Loeb had put in considerably more effort on the script. My Son Is A Man-Wolf! This woman bears no resemblance to Gwen. There's not even a hairband, a dead giveaway. 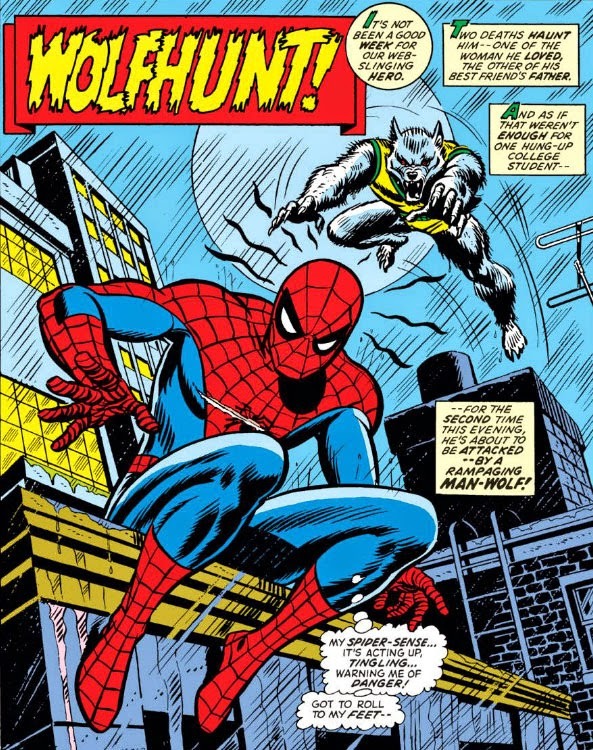 The Man-Wolf could never be mistaken for a taunting, mocking Green Goblin--not even if you strapped him on the Goblin flyer with a sack of pumpkin bombs. 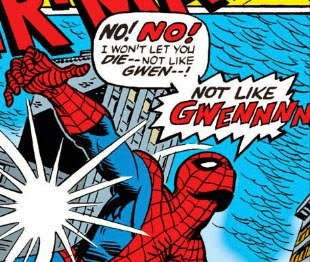 So Kristine may be in danger of dying, but not at all like Gwen. Yet the thought occurs: how many more Spider-Man covers are liable to pull this sort of stunt? I mean, this was Gwen Stacy, not Jean Grey. Spidey rolling to his feet is a good start--but at this point, all it's going to accomplish is meeting his werewolf attacker halfway, as long as he's looking in the opposite direction. Is it finally curtains for Spidey? 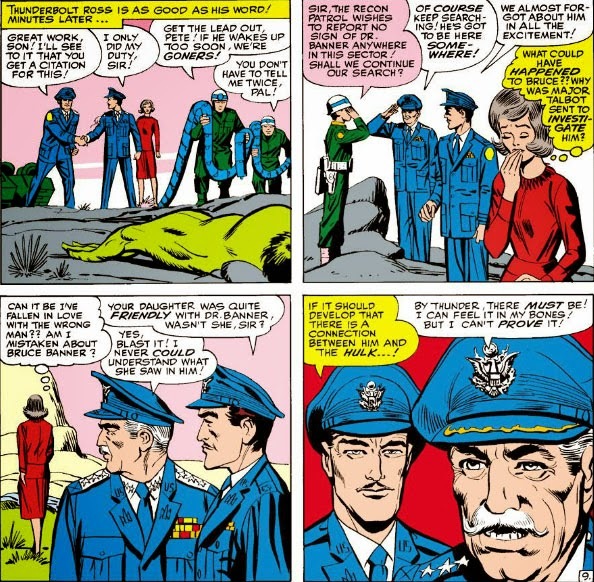 Given his long history as the stalwart right arm of General "Thunderbolt" Ross, it's fair to wonder if there was any more thought put into the character of Maj. Glenn Talbot other than as an aide to Ross, a subordinate to implement his orders and for Ross to play off of when he's strategizing about dealing with the Hulk. 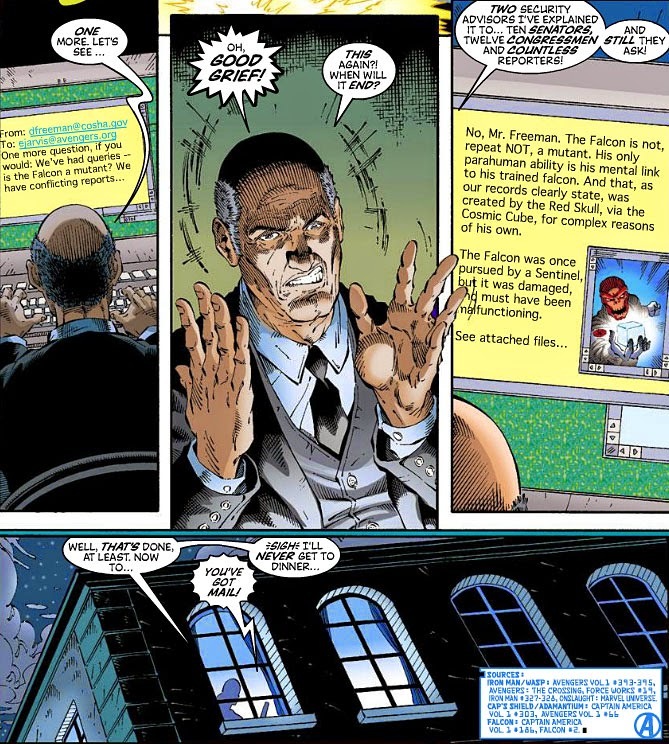 There was generally no question about Talbot's loyalty and dedication to the old man, and he's never been short on his own initiative when the situation called for it. 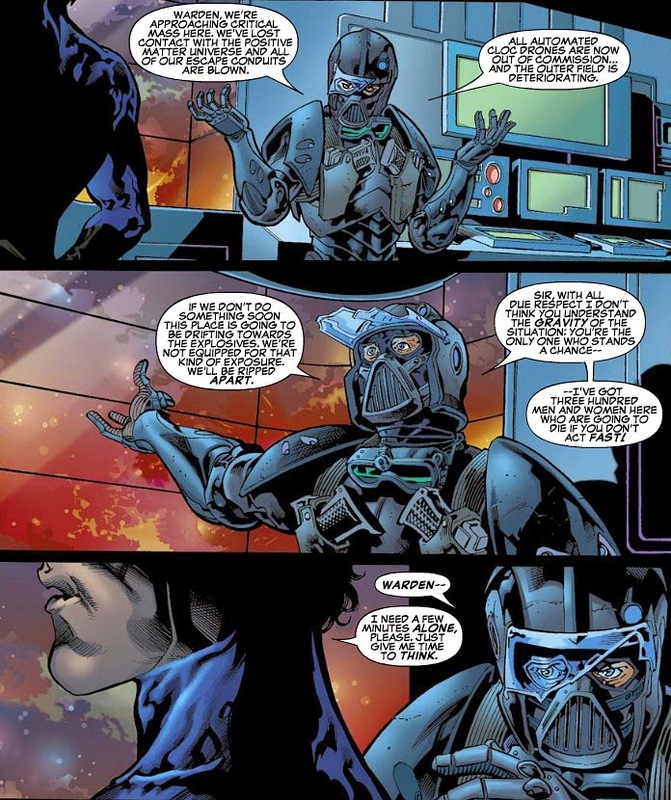 We didn't really see Talbot fleshed out beyond that until after his marriage to Betty Ross, his capture by the Russians (and the consequences thereof), and his subsequent bitterness toward Bruce Banner and the Hulk. 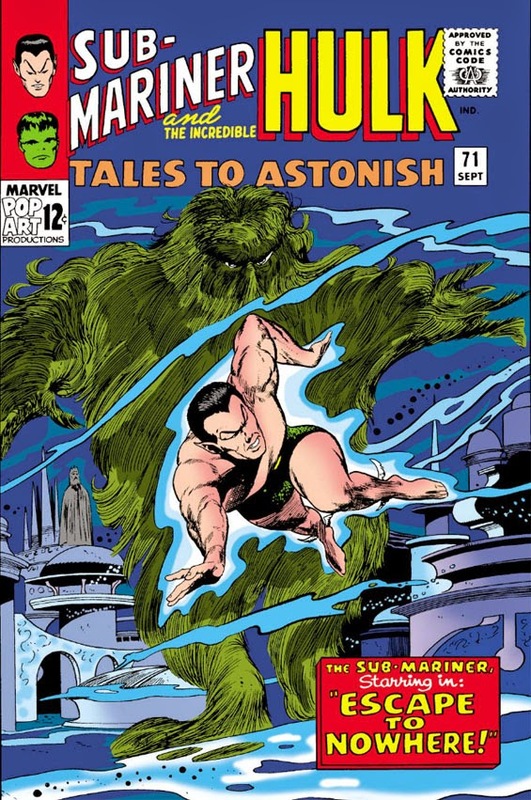 With Talbot's arrival as Security Chief, the character of the Hulk (not yet back in his own title, but being given a second chance on the racks by starring in half of the Tales To Astonish mag) shifts in tone from simply a mysterious, powerful brute roaming the terrain to being investigated in connection with Bruce Banner, thereby raising the profiles of his limited cast of supporting characters and giving the Hulk (and Banner) more to worry about than the threat of the month. Man, he just slides right in, doesn't he? You know, Talbot, Betty's time could very well be valuable to her, fella. Just saying. Some of Mandrake's diplomacy could stand to rub off on you. And so the walls begin to close around Banner--thanks in part to Talbot, who seems to have the General's ear as well as a fast track to his daughter's affections. But there's no question that Talbot, by all indications a fine officer, deserves high marks in his new position here--his first day on base, and he's already been instrumental in capturing the Hulk. And when we catch up with him next time, we'll see that even Bruce Banner's secret would fall into his lap. Prey of the Lion God! 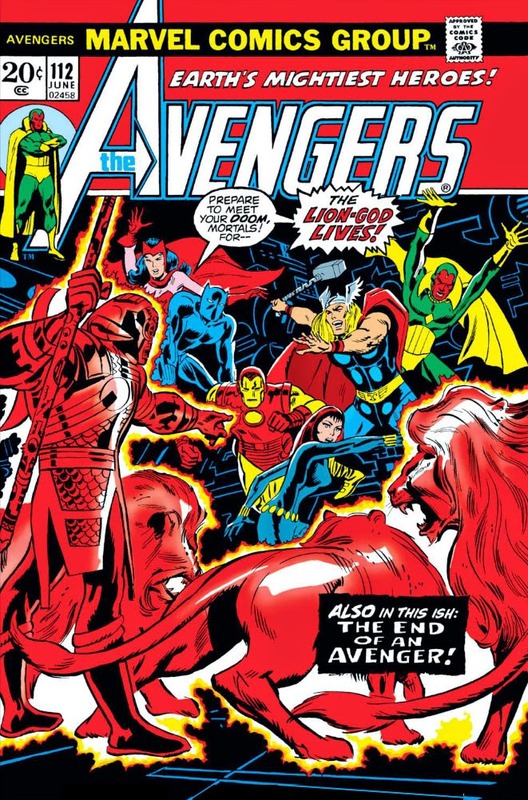 There's a lot to enjoy in both Avengers #112 and its companion issue, #114. 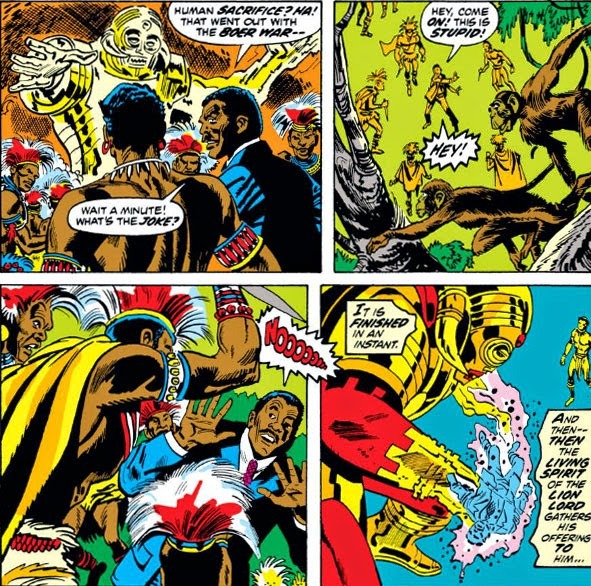 Both issues have in common a brand-new Marvel villain, the Lion God, who's intent on forcing the Black Panther to reveal the secrets of the Panther God. 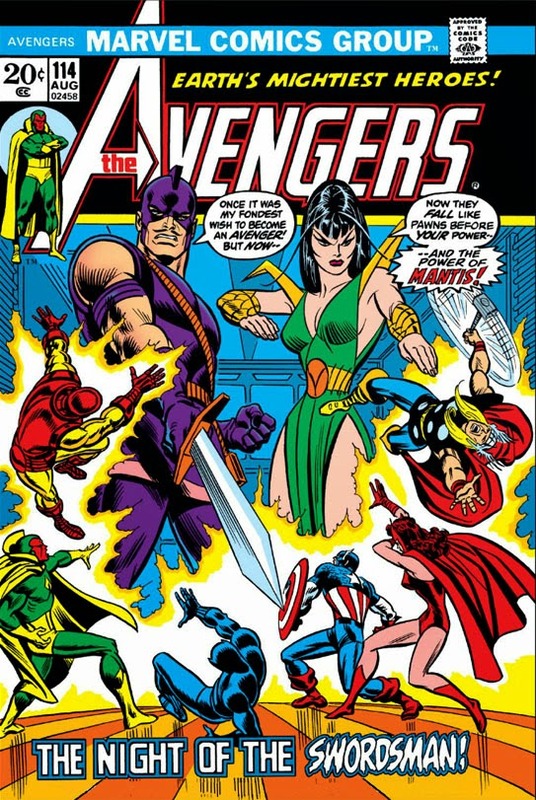 But in each issue we also have a prominent guest-star coming back into the Avengers fold--as well as the first appearance of none other than the enigmatic Mantis, who would have a two-year run in the title and become a popular character in her own right. 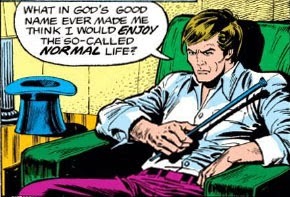 It certainly seems that writer Steve Englehart has comfortably settled in and found his legs with the team, having already taken it through a carefully-planned plot by the Grim Reaper, the resignation of long-time Avenger and fan favorite Hawkeye, and a battle with Magneto who had developed a new ability in addition to his already formidable power. The timing of Natasha's instatement in the Avengers so soon after the sudden departure of Hawkeye (with whom she used to be romantically involved) is a little conspicuous--but since their reunion has taken place elsewhere (in the pages of Daredevil), we can get a clearer picture of how Natasha "fits" as a member of the Avengers without her being shadowed by Clint Barton in every other panel. 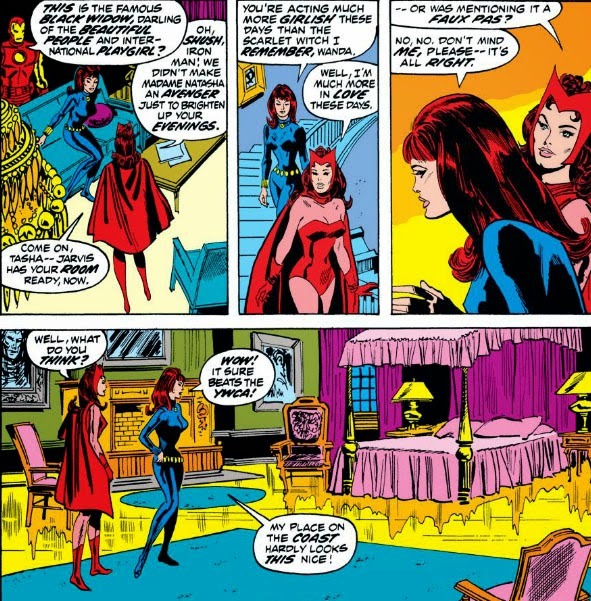 But Natasha is also having another reunion of sorts--with her original artist, Don Heck, who pencilled her in those mid-1960s Tales of Suspense stories where she met both Iron Man and, later, Hawkeye. We'll be seeing Mr. Umbala again--but let's just say he won't be himself. 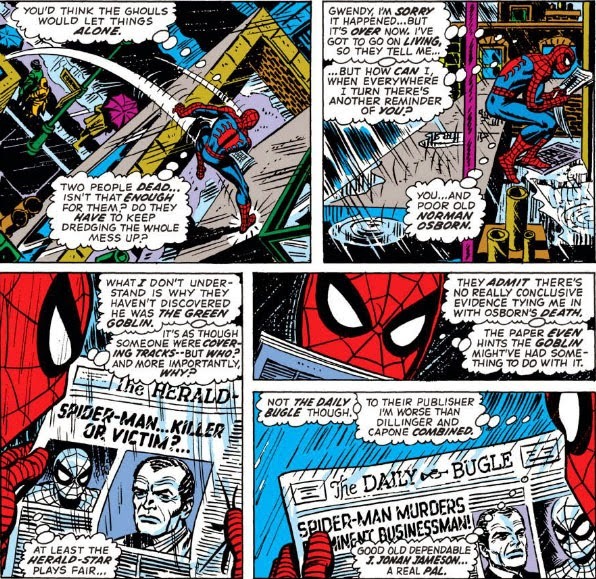 But if there's any accuracy to the cover of issue #124, Jameson is headed for some serious payback--both from Spider-Man, and from the claws of the Man-Wolf, who makes his first Marvel appearance here. The mystery of the Man-Wolf will unfold as we go along, at least for those of you unfamiliar with the character. 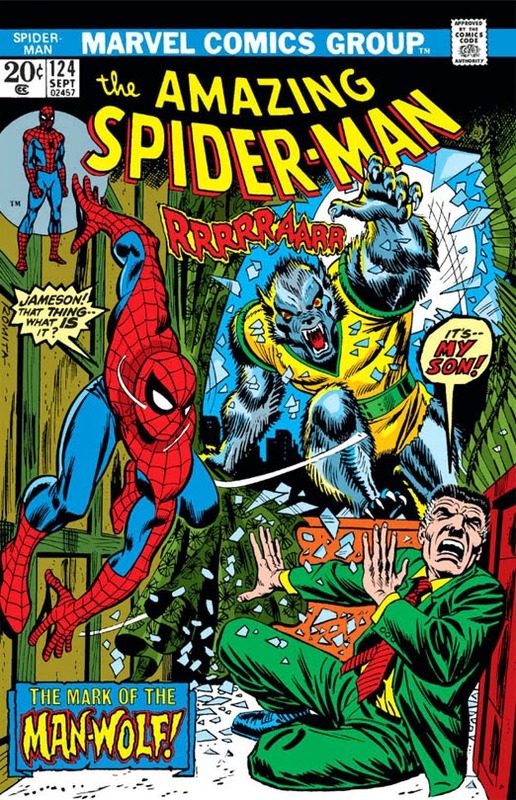 For those who are, a great deal of this two-part "thriller" (as writer Gerry Conway calls it) may seem unnecessary to you, since you've already skipped to the ending, as it were; in fact, you're probably asking yourself why the Man-Wolf would rate a two-part story in the first place. 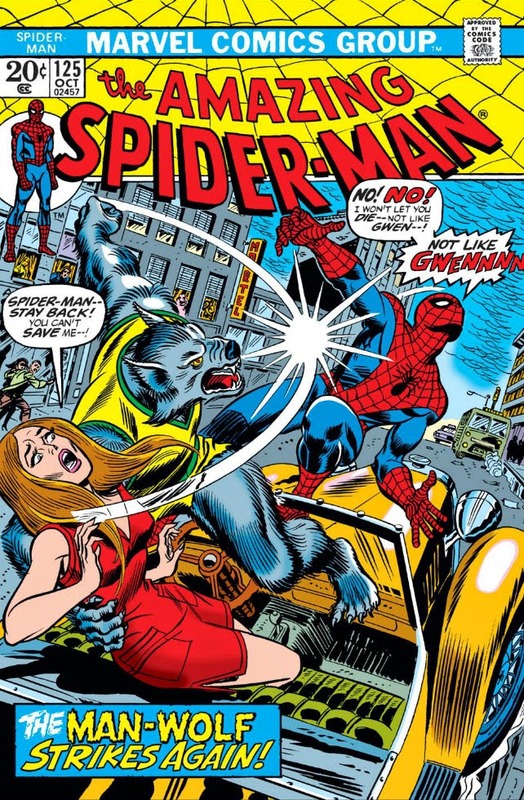 Spider-Man had already battled a werewolf in the pages of Marvel Team-Up--and, boiled down, this creature is simply a werewolf with a twist or two added to set him apart from, er, the pack. But if you put yourself in the place of a new reader, you'll find the story reasonably laid out in terms of raising the questions about this creature--and watching the pieces slowly fall into place for the various characters involved, as in any good horror story, can be its own entertainment. Conway's first hurdle, of course, would seem to be: How do you put a fresh spin on a werewolf story? He starts with the werewolf himself, by making him something out of the ordinary (ordinary for standard werewolf lore, that is). In this case, we get a sense that something is not right with John Jameson, the son of our irascible Bugle publisher, who's now a retired astronaut and engaged to be married. It's an excellent choice for Conway. 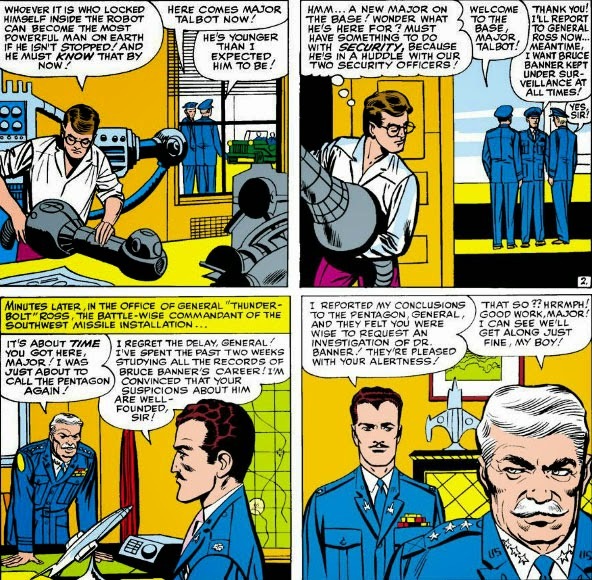 John has always been the upstanding, heroic son to Jameson who could do no wrong, and his appearances in Spider-Man have been related in one way or another to his job as an astronaut. This story will continue those associations--and even though he's no longer in astronautics, his former profession will play a part in the direction Conway wants to lead him. And on that note, it seems this former moonwalker is discovering that the moon is now visiting him. Leave it to Edwin Jarvis, the Avengers' proficient butler, to tie up loose ends and put all in order. And nowhere is he more needed in that respect than at Marvel Comics, where the affairs of the Avengers can become so convoluted that it takes an entire series of issues to straighten everything out. Phooey. Why not just ring up Jarvis? He'll set you straight. Jot off a cc: to Marvel Comics on that one, will you, Jarv? Will someone bring Jarvis a spot of tea? Otherwise, I think that computer is going to find itself flying out the window. Accidentally, of course. I stopped reading Captain America with issue #418 in late 1993--a story which featured Cap in a minor sub-plot tending to Diamondback, while the bulk of the issue focused on Dennis Dunphy, otherwise known as D-Man. 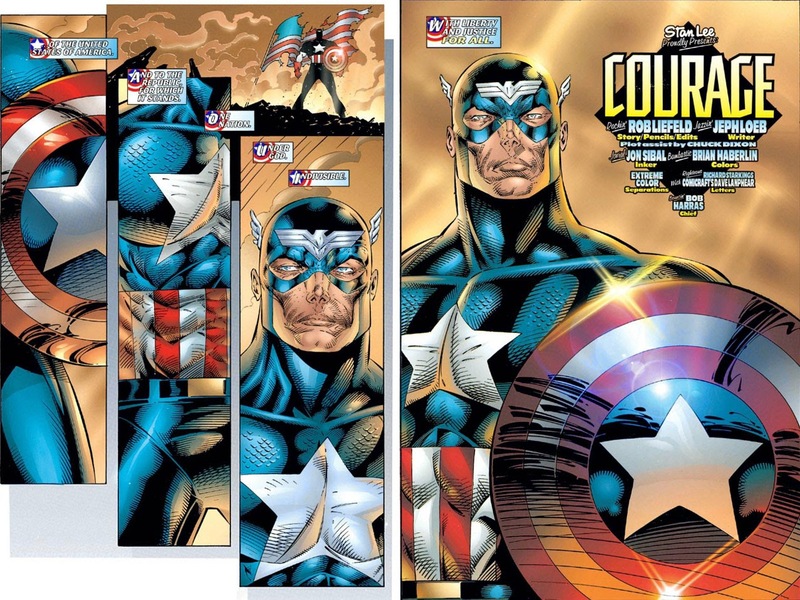 A Captain America issue, starring D-Man. Need I say more. And penned by a member of the military, at that. But I couldn't afford to give much weight to the response: "We think you're going to be happy with developments brewing in these pages real soon...!" Well what else could they say? "It may take awhile for story quality to become better, and we're not quite sure what to do at this point--but we'll get there!" 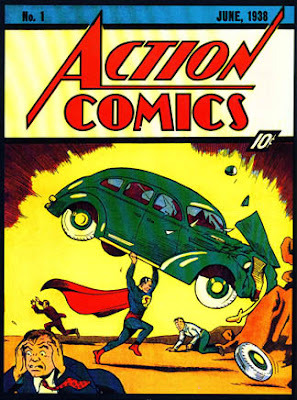 The title ended its run nearly three years later--and judging by the last few issues, the stories did actually rise to the occasion and allowed the good Captain to end on a reasonably high note. But then the "Onslaught" event occurred, effectively putting an end to a number of flagship titles and placing their characters in alternate tales for roughly the next year. It was almost as if we were getting a trial run of the Ultimates format, where the characters were given histories that deviated significantly from the ones we were familiar with. "Heroes Reborn," the banner under which these stories were grouped, acted as a reset button for Fantastic Four, Iron Man, Captain America, The Avengers, and Thor, titles which had all reached unmanageably high issue numbers and were arguably, for want of a better phrase, burned out. 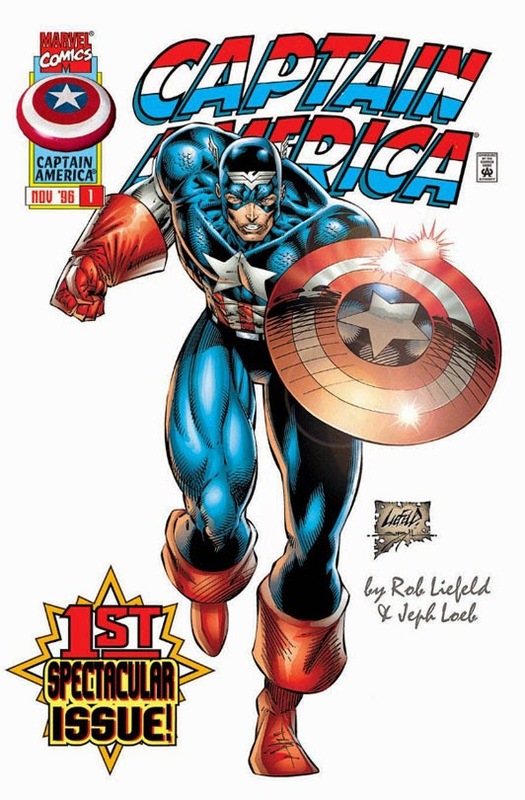 In the case of Captain America, his "rebirth" in an alternate reality would be handled by artist/writer Rob Liefeld, who had already worked with Marvel on the closing issues of New Mutants (which spun off into the new series X-Force, also handled by Liefeld) and Cable, and whose studio would be contracted to handle the new stories of both Captain America and The Avengers. 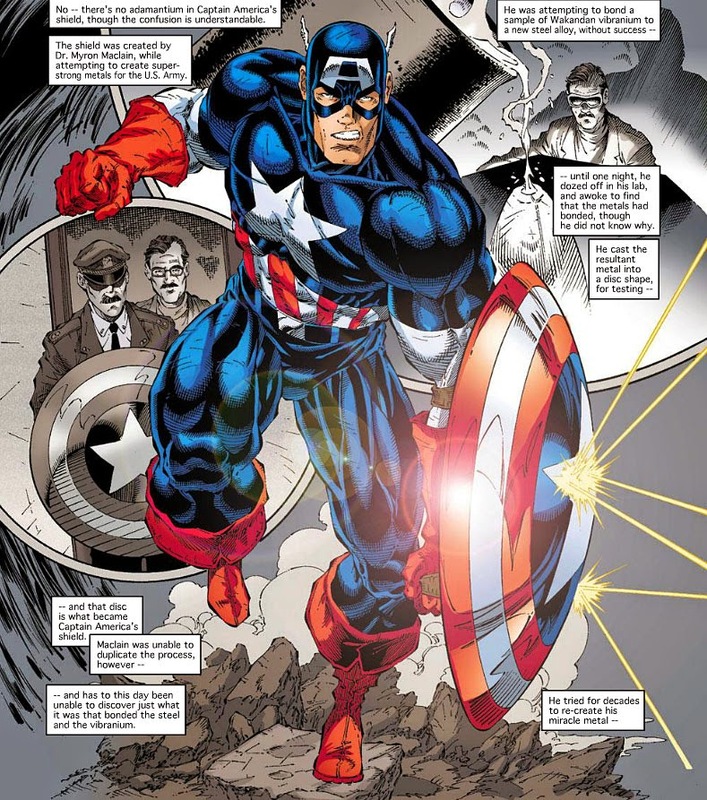 It was during this time that I decided to give Captain America another try--and while "Heroes Reborn" as a whole didn't exactly set the world on fire for me, I was surprised by how much I liked the new direction for and handling of Cap. 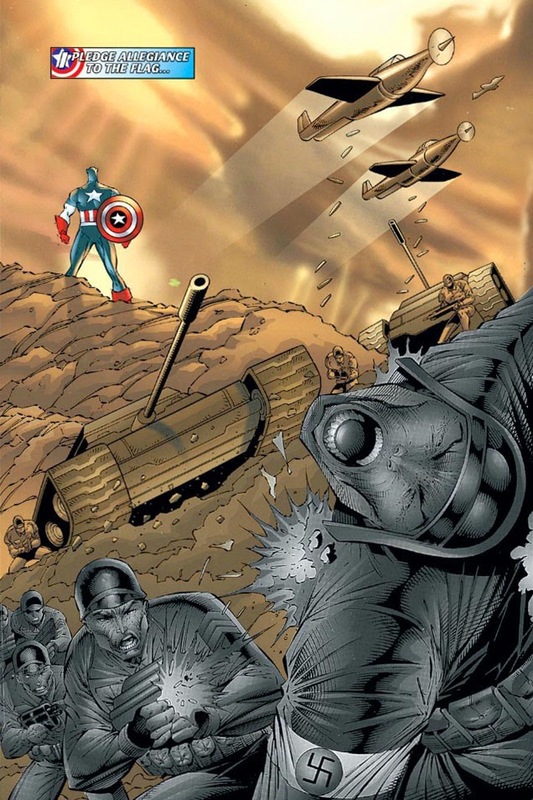 Liefeld and scripter Jeph Loeb (yes, that Jeph Loeb, scripter of the "red Hulk" issues that threw in practically every guest star combination you could think of, with Hulks falling out of the woodwork) brought a lot of patriotic flair back to Cap, while giving this "new" character some interesting history and compelling sub-plots. But more than that, the issue as a whole is put together with great care. 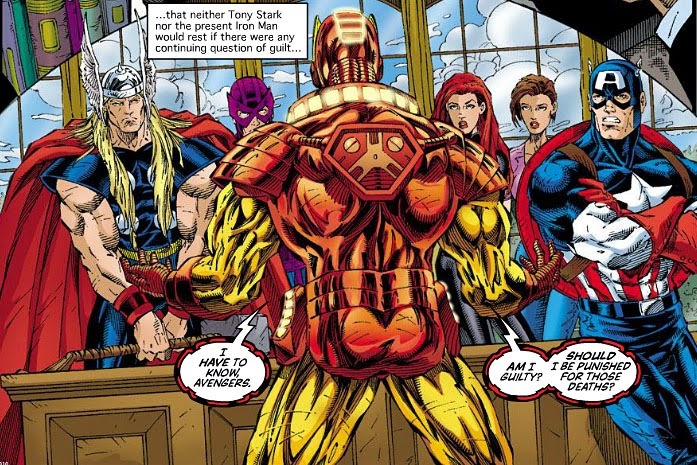 Liefeld, who is credited with not only pencils but also the story and editing, has obviously given considerable thought to its presentation, and certainly demonstrates a feel for the character both in and out of costume. 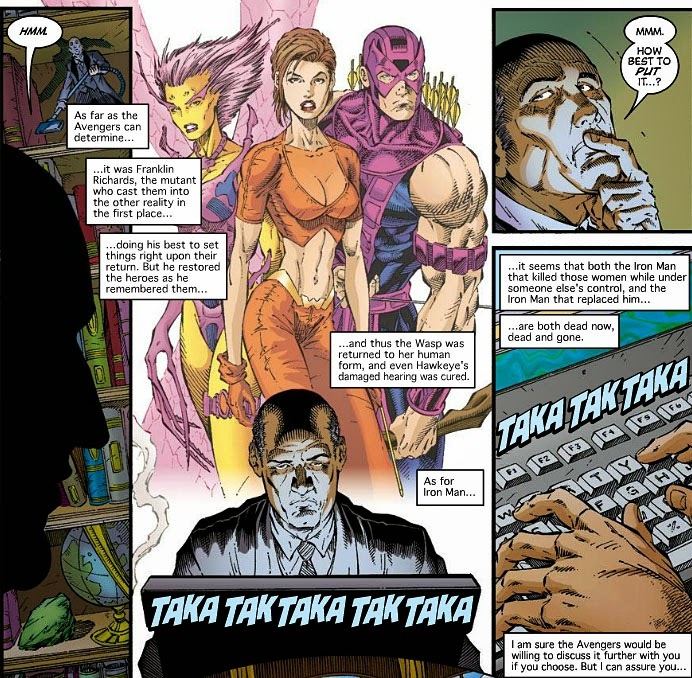 "Heroes Reborn" no doubt stunned many readers who weren't quite sure what was going on with Marvel. The company seemed in disarray, having lost its sense of direction with its own characters and seemed to be starting over and reinventing them on a clean slate. This issue of Captain America, at least, felt like a port in a storm. 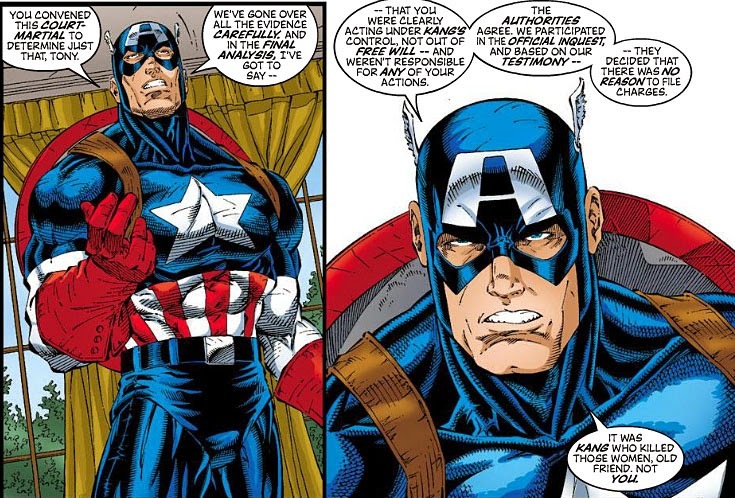 Cap, unlike the other characters caught up in the new line of books, needed no makeover in either appearance or concept. His familiar costume and shield comes across on the printed page as boldly as ever; and the principles and standards by which he's guided simply needed dusting off and a jolt of reaffirmation. In the year-long sub-plot where writer Len Wein has had Bruce Banner take up residence in New York City in an effort to establish a life for himself, we've seen Banner begin to build that life step-by-step, in a way that's almost therapeutic. The first step was to locate a place to live, followed by finding employment--all while managing his condition as the incredible Hulk. Normally, you'd think the two would be incompatible--how does one "manage" an existence as the Hulk? The brute would neither know nor care about Banner's apartment, or his new friends, or his job, or anything else about this man he hates above all others--which means that at some point, Banner's "new life" would become untenable. So how will Wein make something like this work? He starts with Banner himself, who reaches his limit with his rootless and hunted existence and decides to reclaim his life, while making every effort not to change into the Hulk. Of course, if you looked up "high strung" in the dictionary, you'd see a picture of Bruce Banner next to the definition--and since New York is a mecca for super-villain activity, for this man not to occasionally wind up in shredded purple pants would be a minor miracle. Indeed, the Hulk has already appeared, fighting the Absorbing Man at Banner's job site, and appearing in Dr. Druid's conflict with the Maha Yogi. 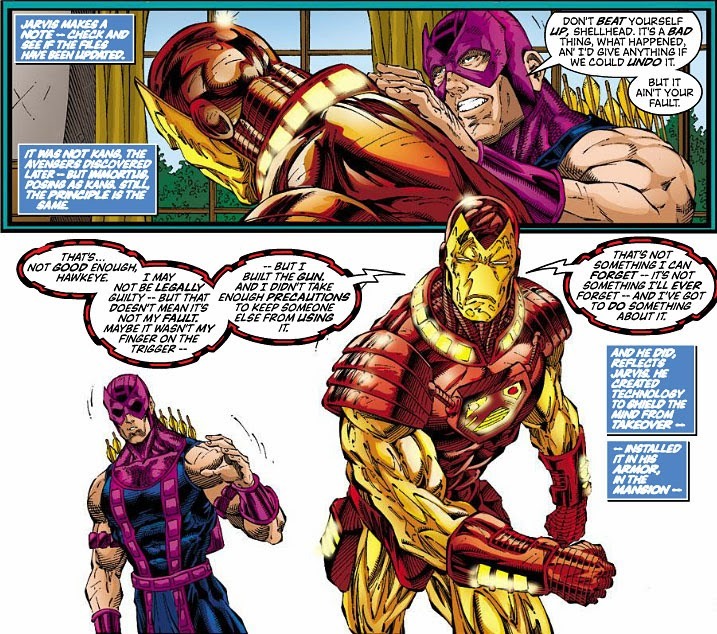 And Banner finds himself slowly coming to terms with the realities of a shared existence with the man-monster. The Fan Behind The Comics!